Step 3 of the Smartbond bond-strengthening system. 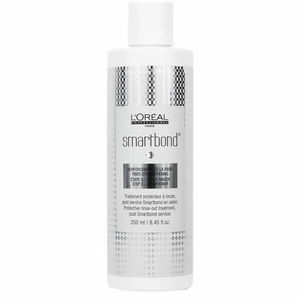 L'Oréal Professionnel Smartbond Strengthening System Conditioner is the 3rd step in L'Oréal's Smartbond system that's designed to strengthen hair bonds and prevent damage to coloured hair. This conditioning treatment can be used in-salon after a Smartbond colouring service or sold to clients to use at home. Used regularly, it will help maintain their hair's strength and protect their colour in the weeks until their next colour service. £16.32 (inc. VAT) Why no VAT? We're a trade wholesaler and quote our prices without VAT to help our VAT-registered customers understand the true cost of a purchase. 2-step hair strengthening process containing maleic acid designed to protect bonds for stronger hair fibre. Contains 125-ml additive (step 1) and 250-ml pre-shampoo (step 2).